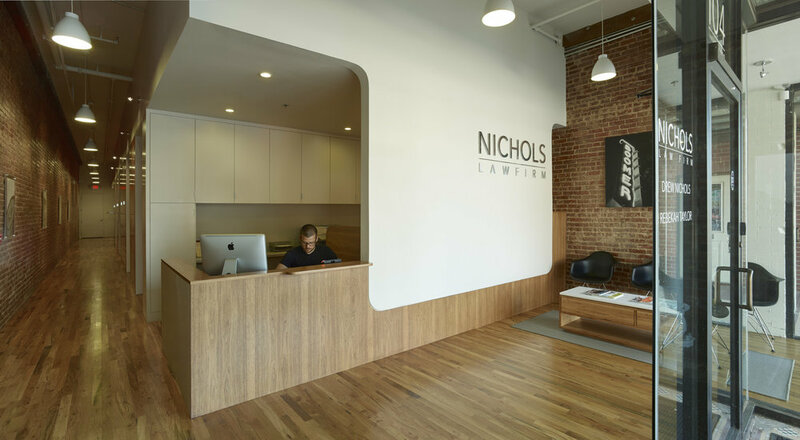 Nichols Law Firm provides an aging downtown Norman with a desperately needed transfusion of activity and transparency. By resuscitating a long vacant historic storefront, the office helps reverse the stagnation that threatens many Main Streets. With the upstairs level just transformed into a loft residence that revels in views of the ornate Sooner Theater across the street, the downstairs space was roped by a local attorney whose heart lay somewhere between his hometown near the Chisholm Trail and the urbanity of New York City. Relocating from a nearby dark and introverted building, the law firm leadership sensed the need to contribute to the revitalization of Main Street while reigniting the practice’s sense of mission in the hearts of its partners and clients.The interior architecture celebrates the dichotomy presented by the attorney’s love for the rustic qualities of the local, and the refined lines of more sophisticated design centers, as symbolized by the Big Apple. The overall parti is developed as a crisp insertion of internal offices and filing areas set into an older mottled brick shell. Hickory and pecan custom millwork is crisply detailed–its knotty grain tamed– and helps create a zone of privacy for offices beyond. Taut white sheetrock wall surfaces frame the clear glazed wood millwork while reflecting light onto new maple floors. An entrance lobby defined by a signage plane with relieved corners helps invite clients in from the street, and tempts views past the reception area to the reinvigorated triple wythe brick wall that leads to the attorneys’ offices and awaiting support.